After 15 years, I have decided to call time on my trusty pair of Bruno Magli whom have traveled around the world with me. As you can see, the black coating on the buckle has come off exposing the brass underneath. The heel collar has become quite scruffy. Still, it was enough for me to ditch this pair of shoes. What did it for me was the elastic band just beneath the tongue has died rendering the shoe too loose for me to walk without fearing that it may fly out ahead of my stride. In fact, it was the excessive rubbing of my heel, as a result of the loose shoe, that scuffed up the heel collar. So by now, you would have realised that the buckle actually does nothing to secure my feet. It is merely a decorative piece. So here's a few tips on how to make your shoe last. First of all, never get rubber-soled shoes. Once they are worn out, they cannot be replaced. So as comfortable as that pair of Hush Puppies is, I am sorry to tell you that it won't last very long. 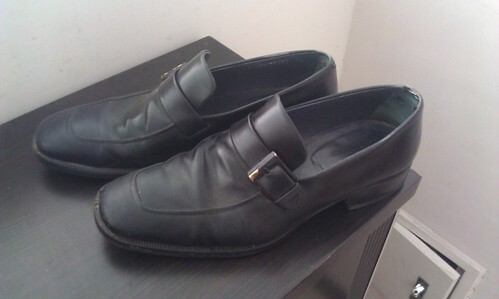 OK, so you have gotten a pair of leather soled shoes, don't wear it just yet. Send it to a cobbler to get soled and heeled i.e. add an additional layer of rubber to protect the leather sole. That way, you only wear out the rubber sole leaving the leather sole intact. Regular changing of the heel is especially important as our feet are mostly either pronated or supinated leaving the heel to be worn out unevenly over a period of time. Unbalanced footwear will do your spine great harm. Speaking of cobbler, I don't really like Mr Minit, I feel that they are just turnkey operators without a deeper knowledge of the shoe. I think even the cobbler at the corner of Holland Village would know more shite about shoes albeit without modern fancy equipment. I send my shoes to Shunkey Services located at the 3rd floor of Far East Plaza. Another tip to ensure a long lasting shoe is regular polishing. According to the cobbler at Shunkey Services, Kiwi shoe polish (tin can and tooth-paste version) is actually not good for the shoe as the polish has a tendency to dry up the leather which may lead to the leather splitting and/or cracking over time. Liquid shoe polish are even worse as much as they provide a fuss-free solution. The thing here is not to be lazy and cultivate a habit of regularly taking care of your shoes. What the cobbler recommended instead is Mink Oil but the word mink brings up images of inhumane slaughtering of these creatures for their fur. I wonder if it is the same when it comes to harvesting their fats. I worry. Lastly, when it comes to removing your shoes, many of us are guilty of stepping on the heel of one shoe with the other one to remove and then switch places to remove the other shoe. Stepping on the heel damages the heel structure and you will end up with limp heels at the end of the day. Again, don't be lazy. Bend over and remove your shoes with your hand. So anyway, thank you Bruno Magli for more than a decade of service. You have done more than taken a grenade for me. Barffie: I can't really say for sure as I am not the expert here. Perhaps you should seek out one of 'em gurus to find out?